I’ve been blogging for a long time. One of the things I rarely run out of is things to write about, but I also know how tricky it can be when you’re under the gun and looking for inspiration. When time is short and themes are elusive, it can be difficult to come up with just the thing to write about, which people would like to read about. To this end I thought that throughout this year to come at the end of each month I’d compile a post full of ideas on themes and things to write about in the month to come. As I researched this the remit widened a little as I found more and more things to cover. I hope you find it useful! There are several feast days which may pique your interest. On Sunday (6th) it’s Mother’s Day here in the UK, and it’s always a nice time to celebrate the mums and mummies. We have an early Easter this year (27th), so it’s always nice to do posts on that if you celebrate the season. I’ll be hosting an Easter get-together and will probably do a post on food and decor for this. St Patrick’s Day on the 17th can produce some fun content too, if you’re Irish or enjoy Irish culture. Spring outfit posts – as we look forward to warmer weather and the newer season clothes are everywhere in stores, it’s nice to share recent buys and new stylings. The new season brings with it a lot of things to do in the city – I love reading what people get up to as we leave the winter behind. Home projects – there’s something about the onset of spring and summer which inspires homemaking instincts. We have a growing list of things we’d like to do around here, from the simple (moving some bookshelves around, swapping some soft furnishings, planting some new items in the garden) to the far more ambitious (swapping a study for a bedroom, getting some builts-in made). Spring cleaning! I know we have some big plans for house tidying this month, and I love picking up other’s tips for this! Spring themed recipes – all sorts of lovely ingredients are coming into season in the next few weeks (peppers, potatoes, spinach), and it’s so nice to come up with new, tasty ways to incorporate them into meals. Travel posts – a couple of paychecks clear of Christmas, and with a long weekend at the end of the month, it’s a great time for a break. We have long weekends planned to both Aberdeen and Luxembourg, I’m super excited to plan them and share them. Special days can be fun to commemorate if they fit with your likes, passions, causes or hobbies. As well as the festivals I’ve mentioned above, there are also lots of food based events for bloggers who write on this. It’s Vegetarian Month, a great chance to showcase meat-free favourites. I’m excited for British Pie Week (7th-13th), because pie. And International Waffle Day on the 25th is definitely a celebration I can get behind! Here in London there are lots of events to look forward to as well. The 3rd of March is World Book Day, and there will be events in many bookshops to mark the occasion. Also expect to see lots of children trooping off to school in costume! On the 5th of March the V&A launch their Botticelli Reimagined exhibition, with over 150 key pieces on display. The 5th also sees the launch of the Urban Food Fest in Shoreditch, which will be running every Saturday until mid-December. Just looking at the website had me hungry! The Head of the River Race takes place on the 19th of March, and is a lovely chance to see some formidable rowers in action. On Easter Sunday there will be the excitement of the annual Oxford and Cambridge boat race – will Cambridge further extend their lead or will Oxford win the day? 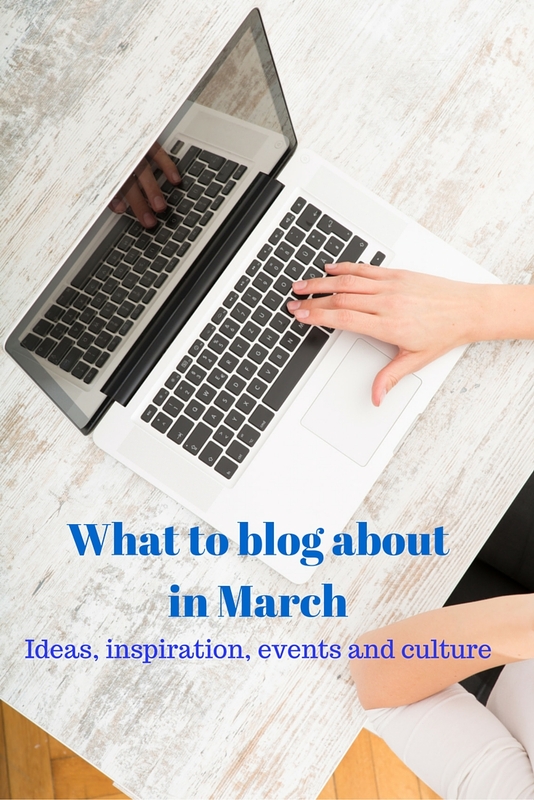 I’ll blog later about some of the cultural elements I’m looking forward to in March, but I hope you’ve found some inspiration here for your March blogging. I can’t believe we’re nearly in spring – this year is FLYING! Hope you’ve all enjoyed/are enjoying your extra day – I love the quirk that is Leap Day. Previous Post #TheLBDI – what a week!